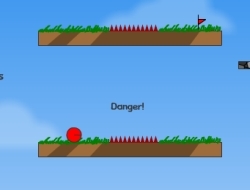 This is a challenging skill game in which you will control a bouncing red ball. The controls are easy to learn, but your timing has to be perfect to pass all the levels. There will be lots of traps that are trying to catch you off guard and burst the ball. Make sure you try and think before you jump over gaps as there might be some spikes on the other side. Also you will have to pass moving axes and lots of dangerous items. Some levels will have huge jumps in them and you have to jump at the right time to get the highest air and pass on the other sides. Luckily for you there are checkpoints in key areas so you will not have to start all over from the beginning when you fail. Try to finish all the levels and then compare your scores with friends. Use the arrow keys to roll and jump, R to restart a level. Red Ball 7.33 between 0 and 10 based on 3 votes.